In our last post we discussed an interesting discussion on automated vehicles and work zones that took place as part of ATSSA’s Midyear meetings. Another automated vehicle presentation was made during ATSSA’s Sign Committee meeting. Mr. Jamie Retterath of Vergence Automation (https://vergenceautomation.com/ ) began by discussing the relative advantages and disadvantages of different kinds of sensors. He pointed out that no single device works best in all conditions. He suggested a combination of sensors and software is the best way to “see” in all conditions. The car’s software would then choose the sensor image with the most contrast and clarity. But the most interesting part of his presentation was a way of positioning vehicles anywhere they travel and in any weather conditions. GPS is not accurate enough to guide vehicles by itself. And the geometry of the road changes frequently due to construction, variations in pavement markings, etc. He called them fiducial signs, meaning points of reference. Even with a foot of snow, these signs would tell vehicles exactly where they were in relation to the road. 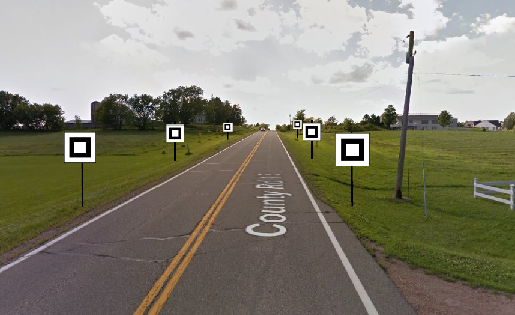 A series of small signs, perhaps as small as 12” square, would be posted on both sides of the road similar to what’s shown in the photo above. These signs would be posted in the digital map. Sensors would see the signs and triangulate their position from them. Anytime the road geometry was changed the next vehicles that drove that stretch would recognize the change and would send that data in to change the digital map. It is a simple and relatively inexpensive way to speed the adoption of autonomous vehicles. We asked about work zones. Mr. Retterath said the first autonomous car to come across a closed lane would see the obstruction and drive around it. Like other changes it encounters, the vehicle would report the closed lane and it would update the digital map in near real time. The same could be done for lane shifts, crossovers, or other geometric changes. These signs would improve location accuracy and could help speed the adoption of autonomous vehicles, thus saving many lives. Its just a concept at this point, but it represents yet another clever way of moving Towards Zero Deaths.